Two weeks from now, she’ll be like a new ship. Sun Princess has entered dry dock at the Sembawang shipyard in Singapore for an update that will have a dual purpose. CND subscribers also read about riding out of town on a rail ... and Cork ready for record..
Seattle, Wash., Aug. 9, 2013 — Holland America Line hosted luncheons at the Port of Seattle Saturday, Aug. 3, 2013, aboard ms Westerdam for Seattle Men’s Chorus and Seattle Women’s Chorus and Sunday, Aug. 4 on ms Oosterdam for the Seattle Theatre Group. The organizations are community partners of Holland America Line. After the luncheon, guests of the Seattle Theatre Group were invited to a special musical production in Oosterdam’s main show lounge followed by a tour of the ship. Guests of the Seattle Men’s and Women’s choruses also were treated to a ship tour following lunch. “We are thankful to Holland America Line for hosting us onboard for this wonderful lunch,” said Frank Stilwagner, executive director of the Choruses. "We couldn’t do what we do without the help of our donors, and this incredible setting and delicious lunch show how much we appreciate our supporters." Seattle Men’s Chorus and Seattle Women’s Chorus are two of the largest community choruses in America. Formed in 1979, Seattle Men’s Chorus is the largest gay men’s chorus in the world with more than 300 singing members. Seattle Women’s Chorus, which debuted in 2002, has quickly grown to over 200 singers. Full-scale choral productions combine the region’s leading professional talents with nationally known guest artists to create events that attract more than 25,000 people to a five-concert series each season. To learn more, visit www.flyinghouse.org. “Seattle Theater Group's loyal subscribers make such a tremendous commitment to our organization, and it is an honor to have partners like Holland America who are willing and available to help us show our appreciation," said Tory Wimer-Contreras, Seattle Theatre Group’s director of patron services. "Holland America is a great supporter of arts and culture, and we're proud to collaborate with them whenever possible." Seattle Theatre Group is a nonprofit arts organization focused on diverse performing arts, education and community engagement, and historic theatre stewardship. The organization presents more than 400 shows annually at the historic Paramount, Moore and Neptune Theaters that range from Broadway, to live music concerts, and includes local arts. For more information about the Seattle Theatre Group, visit http://stgpresents.org. Another speed limit is being imposed on large ships in another portion Glacier Bay National Park because of an increase in whales. Carnival Corp’s private cruise facility on the island of Roatan in the western Caribbean has a new website to give visitors a lot of information before their ship docks at the sprawling 20-acre facility. MIAMI, Aug. 8, 2013 -- Norwegian Cruise Line Holdings Ltd. (Nasdaq:NCLH) ("Norwegian") announced today the pricing of a secondary public offering of 20 million of its ordinary shares by Star NCLC Holdings Ltd. and certain funds affiliated with Apollo Global Management, LLC and TPG Global, LLC (together, the "Selling Shareholders") at a price of $29.75 per ordinary share. The Selling Shareholders have granted the underwriters a 30-day option to purchase an aggregate of up to 3 million additional ordinary shares. Norwegian is not selling any ordinary shares in the offering and will not receive any of the proceeds from the offering. UBS Investment Bank and Barclays are acting as bookrunners and the representatives of the underwriters for the offering. Citigroup, Deutsche Bank Securities, Goldman, Sachs & Co. and J.P. Morgan are also acting as bookrunners for the offering. Credit Agricole CIB, DNB Markets, HSBC, SunTrust Robinson Humphrey and Nomura are acting as co-managers for the offering. A registration statement relating to these securities has been filed with, and declared effective on August 8, 2013 by the United States Securities and Exchange Commission (the "SEC"). A copy of the registration statement can be obtained from the SEC's website at www.sec.gov. This press release does not constitute an offer to sell or the solicitation of an offer to buy, nor will there be any sale of these securities in any state or jurisdiction in which such an offer, solicitation or sale would be unlawful prior to registration or qualification under the securities laws of any such state or jurisdiction. Norwegian Cruise Line is a global cruise line operator, offering cruise experiences for guests with itineraries in North America (including Alaska and Hawaii), the Caribbean, Bermuda, the Mediterranean and the Baltic. This press release contains "forward-looking" statements within the meaning of the federal securities laws. All statements, other than statements of historical facts, included in this press release that address activities, events or developments that Norwegian expects, believes or anticipates will or may occur in the future are forward-looking statements. These statements include but are not limited to forward-looking statements about the proposed offering of ordinary shares of Norwegian and the business of Norwegian. There can be no assurance that actual results will not differ from those expected by management of Norwegian. For more information concerning factors that could cause actual results to differ materially from those conveyed in the forward-looking statements, please refer to the "Risk Factors" section of the registration statement on Form S-1 (as amended and supplemented), initially filed by Norwegian with the SEC on July 30, 2013 and the information included in subsequent amendments and other filings. These forward-looking statements are based on and include Norwegian's expectations as of the date hereof. Norwegian does not undertake any obligation to update or revise such forward-looking statements to reflect events or circumstances that occur, or of which Norwegian becomes aware, after the date hereof. Another woman has taken command of a cruise ship, because Silversea has appointed their first female captain in their 20-year history. Margrith Ettlin was promoted to the rank of captain and took command of Silver Explorer in Reykjavik yesterday. Her first tour of duty will extend into October. A Swiss citizen, Captain Ettlin has extensive maritime experience in remote regions, including the Arctic and Antarctica, and this will be put to good use on Silversea’s expedition ship, Silver Explorer. 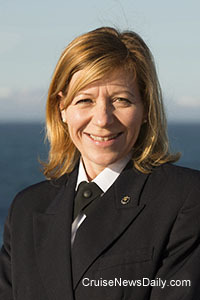 Ettlin joined Silversea as a staff captain in March 2010. Prior to that, she worked for Germany's F. Laeisz shipping group and has nearly nine years as a staff captain with the German shipping company Hapag Lloyd. The latest round of legal wrangling is going on in Charleston (SC) with one faction of the community trying to make sure the cruise industry, and the state and municipal authorities which are trying to make a good home for it, do everything by the book. On the surface they would seem to want to make sure everything is done properly to preserve the integrity of their historic community. But that’s not really what this legal action is about. The Pacific Princess - the setting for every episode of “The Love Boat” - has completed its final voyage. MIAMI, Aug. 7, 2013 -- Norwegian Cruise Line Holdings Ltd. (Nasdaq:NCLH) ("Norwegian") announced today the launch of a secondary public offering of 20 million of its ordinary shares by Star NCLC Holdings Ltd. and certain funds affiliated with Apollo Global Management, LLC and TPG Global, LLC (together, the "Selling Shareholders") pursuant to a registration statement on Form S-1 filed with the U.S. Securities and Exchange Commission (the "SEC"). The Selling Shareholders will grant the underwriters a 30-day option to purchase an aggregate of up to 3 million additional ordinary shares. Norwegian will not sell any ordinary shares in the offering and will not receive any of the proceeds from the offering. A registration statement relating to these securities has been filed with the SEC, but has not yet been declared effective. These securities may not be sold nor may offers to buy be accepted prior to the time the registration statement becomes effective. This press release does not constitute an offer to sell or the solicitation of an offer to buy, nor will there be any sale of these securities in any state or jurisdiction in which such an offer, solicitation or sale would be unlawful prior to registration or qualification under the securities laws of any such state or jurisdiction. MIAMI (August 7, 2013) – Kenneth Jones has been appointed vice president of corporate marketing for Miami-based Carnival Corporation & plc (NYSE/LSE: CCL; NYSE: CUK), the world’s largest cruise vacation group. In this capacity, Jones is responsible for the continued development of the corporate marketing function by collaborating with brand leadership and department heads in the areas of distribution, reservations, marketing, revenue management, and itinerary planning. Jones will join Carnival Corp. & plc on September 4 and will report to Richard Ames, senior vice president of corporate business services. Jones previously served for eight years as a managing partner with Knight Consulting in Orlando, Florida. Prior to that, he was director of internal communications at Walt Disney Theme Parks and Resorts. He also spent several years with advertising agency Ellis & Diaz/Bozell. “These combined experiences will enable Ken to effectively work with the brands in support of existing brand initiatives in marketing and to identify and implement new opportunities in the future,” Ames noted. Jones graduated from the University of Florida with a bachelor of science in advertising and communication. Carnival Corporation & plc is the largest cruise company in the world, with a portfolio of cruise brands in North America, Australia and Asia, comprised of Carnival Cruise Lines, Holland America Line, Princess Cruises, Seabourn, AIDA Cruises, Costa Cruises, Cunard, Ibero Cruises, P&O Cruises (Australia) and P&O Cruises (UK). Together, these brands operate 102 ships totaling 209, 000 lower berths with seven new ships scheduled to be delivered between May 2014 and April 2016. Carnival Corporation & plc also operates Holland America Princess Alaska Tours, the leading tour company in Alaska and the Canadian Yukon. Traded on both the New York and London Stock Exchanges, Carnival Corporation & plc is the only group in the world to be included in both the S&P 500 and the FTSE 100 indices. * What’s Missing from this Story? You can add another city to the growing list that thinks it will be a fine idea to welcome cruise ships to their city. Salem, Massachusetts, says it has the resources, so why not put some money into developing them, and have cruise ships call? If you’ve been wanting a new app for your phone (or tablet) Celebrity Cruises has what just may satisfy your thirst - their new (and free!) Cruise Lingo app. CALABASAS, Calif., Aug. 6, 2013 -- Award-winning river cruise line AmaWaterways christened its newest ship in Vilshofen, Germany today, amid great fanfare provided by dancers, singers, musicians, stilt walkers and other local performers. The highlight of the event was the traditional christening of the AmaPrima by its honorary godmother, Valerie Wilson, founder, chairman and CEO of NYC-based Valerie Wilson Travel, Inc.
"Almost everyone in Vilshofen played some kind of role in the AmaPrima's christening ceremony today," noted Kristin Karst, AmaWaterways' executive vice president and co-owner. "We couldn't have asked for a more supportive or festive atmosphere, or for a warmer welcome for our godmother, Valerie Wilson. It's been a simply wonderful day for all involved." The afternoon festivities kicked off with rousing oom-pah music performed by a local band, and costumed stilt walkers who moved amongst the crowd gathered along the banks of the Danube River. As the AmaPrima cruised into port, the Triumphal March from Verdi's opera "Aida" played over loudspeakers and artillery experts shot ceremonial gun salutes from the top deck of the ship. AmaWaterways' Manager of European Operations, Wade Korzan, served as Master of Ceremonies and greeted the enthusiastic onlookers, local dignitaries, river cruise executives, journalists and passengers. Kristin Karst and AmaWaterways' president and co-owner President Rudi Schreiner made speeches, as did Valerie Wilson and Vilshofen Mayor Georg Krenn. Wilson christened the AmaPrima in the time-honored tradition, breaking a bottle of Champagne against the ship's hull. Amid a chorus of cheers and applause, doves were released into the sky as the Vilshofen Fire Department sprayed a plume of water high over the river. Other highlights included a special blessing of the ship by a local pastor, songs by soprano Heidlinde Schmid and an Indiana Jones-like whipcracking demonstration (a Bavarian tradition). Children from a folkloric club performed traditional dances and presented the Vilshofen flag to the AmaPrima's captain, Jan de Bruin, who also signed the town's ceremonial "Golden Book" along with other VIPs in attendance. The tradition of christening a ship originated more than 4,000 years ago. A respected and well-known woman is selected to serve as a new ship's honorary "godmother," entrusted with blessing the vessel to ensure the safety of its passengers and crew. The AmaPrima's godmother, Valerie Wilson, heads one of the largest privately owned and family-managed travel agencies in the United States. She has been honored with many prestigious awards, serves on numerous advisory boards and has shared her expertise with readers of The Wall Street Journal, The New York Times, Town & Country and Travel + Leisure, among others. She is also the author of "Valerie Wilson's World...The Top Hotels & Resorts." The AmaPrima, a sister ship to the award-winning AmaCerto (2012), is a deluxe164-feet passenger vessel that incorporates such innovative design features as Twin Balconies (an AmaWaterways exclusive) and spacious staterooms that measure up to 350 sq. feet. Guests also enjoy Chaine des Rotisseurs culinary creations with unlimited fine wine and beer, a choice of dining venues, a heated pool with swim-up bar, massage and beauty salon, fitness studio, and complimentary in-room Internet, Infotainment and Wi-Fi. The AmaPrima even carries a fleet of bicycles on board so guests can enjoy Europe's scenic riverside bike paths on their own. The AmaPrima will serve the Dutch and Belgium Waterways and the Danube and Rhine Rivers on 10 itineraries: Tulip Time Cruise; The Romantic Danube; Melodies of the Danube; The Legendary Danube; Blue Danube Discovery; Black Sea Voyage; Magnificent Europe; Grand Danube Cruise; Christmas Time Cruise; and Great Capitals & Vintages of the Danube. For more information on AmaWaterways, please visit www.amawaterways.com. AmaWaterways' European fleet includes AmaReina (2014); AmaSonata (2014); AmaPrima (2013); AmaCerto (2012); AmaVerde (2011); AmaBella (2010); AmaLyra (2009); AmaDolce (2009); AmaCello (2008), AmaDante (2008); AmaLegro (2007) and AmaDagio (2006). The line's newest ships feature Twin Balcony Staterooms, multiple dining venues, complimentary in-room Internet and Infotainment, a heated swimming pool or whirlpool, plus many more unique design elements. The company's AmaVoyages division has a fleet of five ships: AmaVida (2013) on the Douro River in Portugal; AmaLotus (2011) and La Marguerite (2009) on the Mekong in Vietnam and Cambodia; AmaKatarina (rebuilt 2011) on the Volga in Russia; and the Zambezi Queen (2009) on the Chobe in Botswana. Oceania’s largest refurbishment project in history is set for late next spring and involves significant upgrades to three ships: Regatta, Insignia and Nautica. The $50 million project will take place over a six-week period and bring many of the areas aboard the ships into line with the styles and colors found on Oceania’s newest ships. Carnival Legend is set to leave the US for its new home port in Australia in the fall of 2014. Before it goes, it will undergo a multi-million-dollar upgrade to bring new features aboard the ship. Not surprisingly, Carnival has scheduled a 36-day repositioning for the ship, which they’ve just opened for sale. (Ft. Lauderdale, FL -- August 5, 2013) Ultra-luxury Silversea Cruises today announced the appointment of two new area sales directors to cover key regions. Dave Socha has joined to cover central California, parts of Southern California, Nevada and Utah, and Bob Tolster will be responsible for New England, Long Island and a portion of New York City. "I'm very pleased to welcome Dave and Bob to the Silversea team," said Kristian Anderson, Silversea's vice president of sales for North America. "They are joining the most energetic, responsive and productive sales team in the industry. Their broad range of experience and accomplishments in the travel sector is going to be a tremendous asset to Silversea and our travel agent partners as we continue to drive new business in these important markets." Dave Socha is based in Southern California and joins Silversea from Windstar Cruises, where he was the western regional sales manager. His extensive background in the travel industry includes eight years with Oceania Cruises as a regional sales director. He has also held sales positions with Club Med and The Hertz Corporation. He reports to Nancy Gonzales, regional sales director for the western region. Based in New York, Bob Tolster reports to Kris Emery, regional sales director for the eastern region. He comes to Silversea with over eight years' sales experience working at Royal Caribbean International, most recently as the business development manager for Long Island. He is a director-affiliate on the executive board of Travel Agents of Suffolk County (New York).